Many of you have written to blogger Jeremy about the recent article in the New York Times, "The Peanut Solution". The article describes an item that, by all accounts, is an easy-to-manufacture and easy-to-administer wonder treatment for malnutrition: a paste made of crushed peanuts and vitamins. The vitamin-loaded peanut paste described as “the peanut solution” is the subject of various patents (in 38 countries) held by a French company called Nutriset. Nutriset also holds registered trademarks for the product name Plumpy’nut. The New York Times article recounts the creation and development of Plumpy’nut, as well as its successes in numerous poverty-stricken countries where childhood death rates soar in large part due to severe malnutrition. The article also provides an interesting view of the struggles among Nutriset, humanitarian aid groups seeking more affordable and/or locally-produced alternatives to Nutriset’s Plumpy’nut, and numerous companies that would like to manufacture similar peanut-based pastes as humanitarian aid without running afoul of Nutriset’s patents. The food manufacturers that would like to produce competing “ready-to-use therapeutic foods” argue that Nutriset’s patent is overbroad, foreclosing the production of any nut-based pastes for nutritional uses. However, the fact that nuts are high in natural fats, proteins and vitamins, coupled with their ready (and inexpensive) availability in vast quantities throughout many countries, is precisely why they make such an attractive, and practical, base for a nutritional supplement to treat malnutrition. These would-be competing manufacturers are hoping to succeed in challenging the validity of Nutriset’s patents so they can begin distributing their own paste formulae. With this information in mind, I’d like to pose a question as, ahem, food for thought: Should the patents protecting humanitarian developments such as Plumpy’nut be more easily subject to compulsory licenses in order to ensure that such products are available at cost-effective prices and able to reach those that need them most? Some countries’ governments may be able to satisfy the TRIPS requirements for compulsory licensing (see the requirements here). However, it doesn’t seem that this opportunity has been exercised in any country. Certain countries that would seemingly satisfy the TRIPS requirements may not have the manufacturing capabilities needed for local production. On the other hand, there are interested manufacturers in other countries, like the United States, that would probably not satisfy the current TRIPS terms (for example, that the license be used predominantly to supply the domestic market). But such manufacturers, given the opportunity, could help supply treatments to many more children in need in numerous countries. 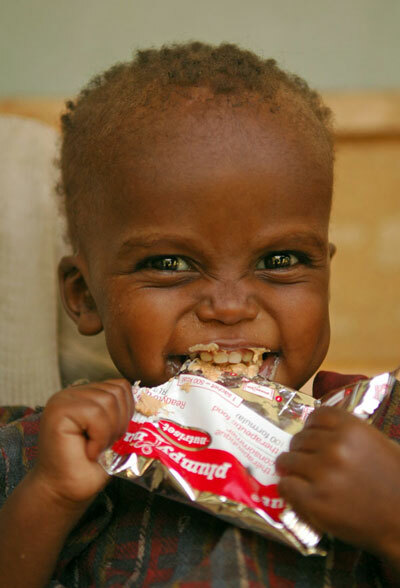 And yet, two months of malnutrition treatment with Plumpy’nut costs $60 per child. Such a simple remedy made from ingredients that are readily available in the areas where the treatment is most needed remains cost prohibitive for many would-be recipients of Plumpy’nut – and for the governmental and non-government organizations that purchase Plumpy’nut and other medicines to include in humanitarian aid supply deliveries. Surely if there is a product most appropriate for compulsory licensing it would be Plumpy’nut, which was developed by a humanitarian medical worker to treat the neediest among us. Navyn Salem, Nutriset’s exclusive United States-based Plumpy’nut manufacturer, put it best: “We’re trying to put ourselves out of business. That would be the best-case scenario.” If it were possible for other companies to supplement Nutriset’s output by distributing as many units of similar malnutrition treatments as they can manufacture, that seems like the best-case scenario to me. Or is that thought just nutty? Feel free to share opinions as comments to this post. Thanks for this excellent post Miri. As to the patentability of this miracle solution, I am wondering where is the required inventive step? ?